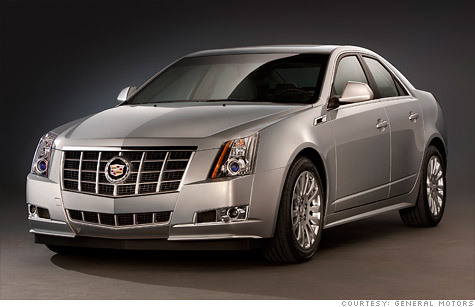 Cadillac ranked third behind Lexus and Porsche in the latest J.D. Power Dependability Study as domestic automakers closed the quality gap compared to imported cars. NEW YORK (CNNMoney) -- The dependability of cars is continuing to improve, according to a new survey by J.D. Power and Associates and domestic brands, in particular, are narrowing the gap in quality compared to the Japanese automakers. Overall scores in the survey were the best they've ever been since the survey's inception in 1990. The top three brands with the fewest problems were Lexus (Toyota's (TM) luxury brand), Porsche and General Motors' (GM, Fortune 500) luxury brand, Cadillac. The most problem-free car captured in the survey was the 2009 Lexus LS. But while car owners are reporting fewer problems, car shoppers still don't seem to be getting the message, especially in regard to domestic vehicles, the market research company said. J.D. Power surveyed owners of three year old cars -- those from the 2009 model year -- about how many problems they'd experienced in the past year. Dependability is gauged by the number of problems per 100 of each make and model of a car. Most automakers improved since last year's survey, which involved 2008 model year cars, but domestic automakers improved faster than the Japanese brands. The gap between Japanese and domestic brands narrowed from 20 problems per 100 vehicles last year to 17 this year. European brands, overall, slightly lagged both American and Asian automakers. On average, European cars had six more problems per 100 vehicles than domestic cars. Among European cars, Mercedes-Benz was the only brand besides Porsche to rank above average. Buyers aren't getting it: In a separate survey, J.D. Power found that customer perceptions about vehicle quality seriously lags the data. "In particular, during the past four years, models Buick, Cadillac, Ford, Hyundai and Lincoln have achieved consistently strong levels of dependability, but still have relatively high proportions of new vehicle buyers expressing concerns," said David Sargent who heads the automotive division of J.D. Power. Often, consumers' perceptions of vehicle quality are based on past experiences or anecdotes form acquaintances, which may represent incomplete or outdated information, Sargent said. While domestic brands improved, overall, not all did well compared to competitors. Besides Cadillac, the only brands to actually rank above average were Ford's luxury Lincoln brand, its mainstream Ford brand and General Motors' Buick. The three Chrysler brands -- Jeep, Dodge and Chrysler -- filled the bottom three ranks in the survey. Chrysler's quality has improved over the last three years, however, according to two other surveys: J.D. Power's Initial Quality Surveys and Consumer Reports' surveys. Historically, J.D. Power's Initial Quality Survey, which measures how many problems new cars have in the months after purchase, has been shown to be a good predictor of longer-term dependability.